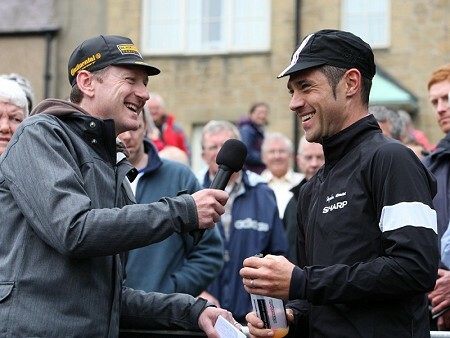 Leader of the Premier Calendar series in 2010, Chris Newton, Rapha Condor Sharp, has won the latest round, the Beaumont Trophy in the North East of the country. Controlling the race using his vast experience and awesome talent, Newton was the only rider able to react when winner of round 1, Simon Richardson (Sigma Sport Specialized) attacked late in the race and the two of them then proceeded to ride away from the rest with Newton far too strong in the sprint. The Beaumont Trophy is a long established event of 59 years and has been won by many famous riders over the years. The most prolific winner of the trophy is Ray Wetherell, who has won it five times in the 60’s and last year, Olympic Champion Bradley Wiggins, added his name to an already star studded list. The race is run over a few circuits based around Stamfordham, a picturesque village 13 miles North West of Newcastle and took the riders over the savage climb of the Ryals which did its job of destroying the race for many from the moment the riders took on the challenge of conquering its steep slopes. With the richest prize list of any Premier Calendar, there was plenty to motivate the riders as they rolled out of Stamfordham to begin their 103 mile race. The weather at the start was more annoyingly damp than anything and within 10 miles, the rain capes were coming off as the pace of the race continued to rise and rise and when they hit the mile long climb of the Ryals for the first time, riders were soon in trouble, among them Ian Wilkinson of Endura. This climb rears up in three stages with the middle ramp being rated at 30 percent. That is seriously steep and it soon had riders in trouble as they dropped out of the back of the peloton which was not hanging around, even at this early stage. As the race wound its way through the narrow twisty lanes on the big circuit to be covered four times, the peloton was lined out and many riders were soon being shelled from the back of the peloton as their skills and ability were found wanting on this technically difficult circuit. By the time the race had seen 20 miles pass under its wheels, a group went clear of the peloton containing many of the favourites. 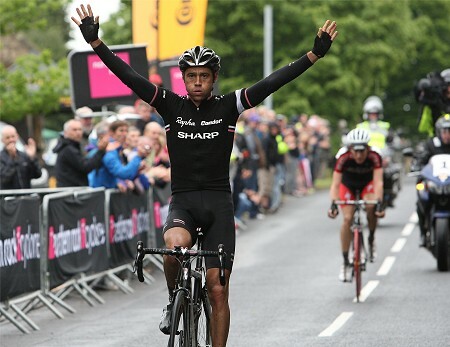 Rapha Condor Sharp had Newton, Graham Briggs, and Jonathan Tiernan Locke in there while arch rivals Endura too had multiple riders with Evan Oliphant and Kiwi champion Jack Bauer. 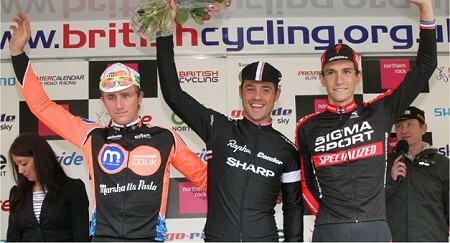 Motorpoint/Marshals Pasta were represented by Peter Williams and Jonny McEvoy. This group was then strengthened when many more riders joined it including Dan Craven (Rapha Condor Sharp), Andy Tennant (Motorpoint Marshals Pasta), Steve Lampier (Pendagon/Le Col/Colnago) and John Tanner (Sports Cover). Early on, the lead of the 16 or so strong break was yo-yoing up and down between 45 and 20 seconds and whilst there didn’t appear to be any urgency in the break, nor was there any in the peloton. A constant tempo in the break though soon had them establishing their lead but this even pace was soon shattered the second time up the Ryals when Steve Lampier shot out of the group to tackle the steep slopes at speed. The break then exploded and their lead was now well and truly established with the bunch many minutes behind. Newton, winner of the Premier Calendar back in 1998, is one of the master tacticians in the British pro peloton who is also able to back it up with a winner’s mentality and an awesome ability that few can live with. He could be seen urging the riders on, giving them information on which way to rotate and wasn’t shy at cajoling his own teammate Graham Briggs to getting a move on. With a lap to go, the now very much slimmed down lead group included Newton, Richardson, Williams, McEvoy, Oliphant and Briggs while the chasers, Craven and Bauer, were already a minute down and losing time. The race was by now into the real serious end of the racing and Richardson knew he had to get rid of the rest and try and repeat his solo win in the first round of the Premier Calendar which was in the North East as well. Using the savage climb of the Ryals as his spring board, Richardson attacked for all he was worth but Newton was equal to the task and when Richardson swung over, Newton then attacked but the Sigma rider wasn’t letting him go anywhere either. The two of them continued their personal battle all the way up the slopes of the Ryals and the only rider able to even attempt to go with them was Pete Williams. The challenge though to bridge the growing gap was too much for him and Richardson and Newton kept the momentum going in their little tandem, leaving their rivals well and truly behind. With huge crowds cheering Newton on in his home territory, the leaders continued at speed to race towards the finish. The two of them could be seen side-by-side talking at times and then doing long turns at the front to make sure the break succeeded. With three kilometres left, Richardson tried his luck to get ride of Newton from his back wheel but that wasn’t going to happen and the two of them came into the finish area with Newton already clear of his rival. With his parents watching, Newton ever the pro, looked around to see where his rival was and seeing he had time to celebrate the victory on the bike, the former World Points champion, milked the crowd’s applause for all it was worth as he celebrated yet another Premier Calendar victory to go with the Lincoln GP and the DoonHame. Afterwards, Newton explained he had felt good and in control of the race from start to finish. Knowing the circuit helped but it was Newton’s talent for riding a bike fast, very fast, that brought him the winners bouquet and champagne, which were duly despatched to his parents. Flowers for mum and champagne for his dad. The Beaumont Trophy had turned out to be quite a day for the Newton family as the prodigal son returned home and the event yet again lived up to it’s reputation as one the country’s top races.